Every scar you have tells its own story, from a skateboard accident when you were younger, to a propensity for chewing your cuticles. Scars encompass many periods in your life, from those created in childbirth to those inflicted by surgeons. They are all unique to each individual and often symbolize change. Not all change is voluntary though, as those who get their scars from operations may feel unhappy and ashamed of their blemishes- or may choose to be proud and take possession instead! This was the philoshpy behind It’s my Scar jewellery, created by Francesca, who had thyroid cancer. The operation to remove her thyroid left her with a noticeable scar on her neck, and she was left with two options. She could take the poloneck/scarf route, or she could celebrate the fact that the scar symbolized a new lease of life, and how better to do that than immortalize it in metal? 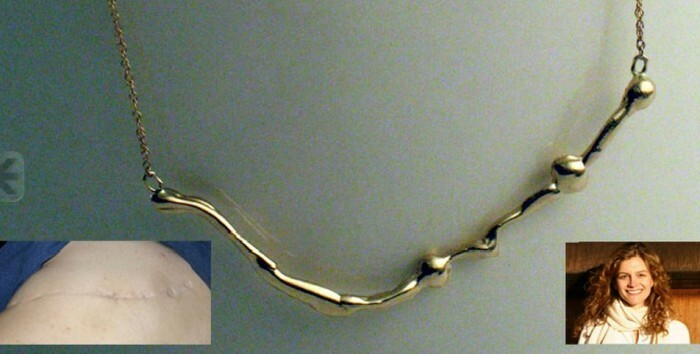 A wax rendering of the scar was made, and then it was cast and then the piece was molded out of precious metal, to be worn with pride just below the scar. 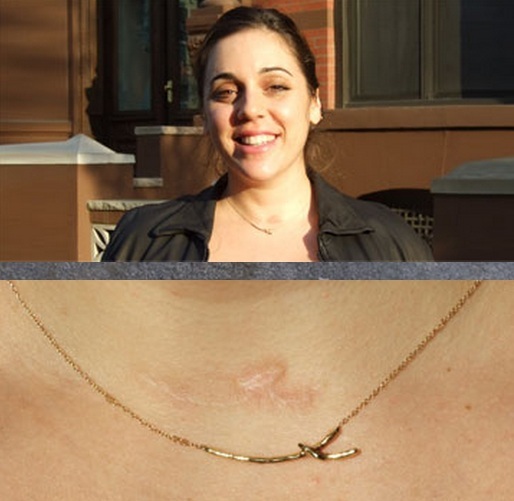 This creation spawned a business, where people worldwide send images of their scars in to be turned into wearable and stylish reminders.